The DR910 passive isolator is used for the electrical isolation and processing of analog 0 to 20 mA or 4 to 20 mA standard current signals. The DR910 provides electrical isolation between the control electronics and process I/O. In addition, interference signals above 75 Hz are effectively suppressed. Input and output circuit do not require separate auxiliary power. The DR910 obtains power from the input signal. The modules are snapped onto symmetrical DIN rails in accordance with EN 50 022. When using the DR910, ensure that the current-driving voltage of the measuring transducer is sufficient for driving the maximum current of 20 mA, with a power loss of 2.5 V (2.5 V + (20 mA * RLOAD). Voltage drop across the input is calculated by determining the load resistance of the output loop, drawing a vertical line to the curve (see diagram), then horizontally to the voltage drop. The energy for the supply on the input side is taken from the analog input signal. Due to the dynamic input resistance, a power loss of approximately 2.5 V drops at the module input. 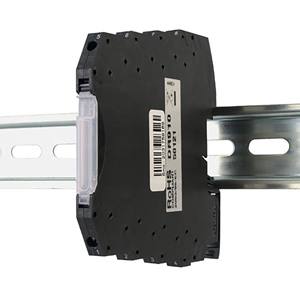 Mounting: Standard DIN style rail, including top hat (T) profile rail according to EN50022 - 35 X 7.5 and 35 X 15, and G profile rail according to EN50035 - G32.